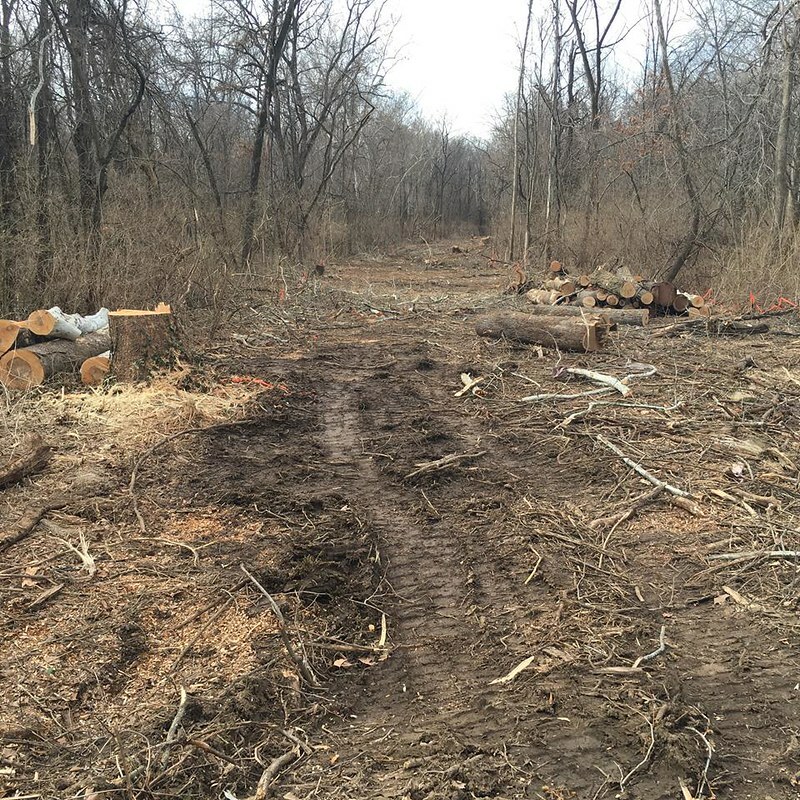 COLUMBIA, Mo 6/18/16 (Op Ed) -- Deforestation has been on ugly display along the Katy Trail as city crews bulldoze trees to replace failing sewer lines (left). Not to worry, Columbia city officials say. They plan to "re-forest" the area. Preventing deforestation instead of planning reforestation is a much better option, says former Columbia Public Works superintendent Bill Weitkemper, a sewer expert who retired after nearly 40 years at City Hall. Columbia sewer construction practices include "destruction of swaths of mature trees wide enough to land a large airplane," he explains. A lazy-man's money-saver, deforestation puts tax-and-rate payer dollars in bank coffers and ultimately, developer hands. Reforestation is a consolation prizefor a public which has lost trees people may never see re-grow during their lives. Adverse impacts to the environment resulting from construction projects can be avoided or minimized through careful design and proper construction practices. The City of Columbia should assure that construction projects preserve the environment as much as possible rather than worrying about how to restore the environment after it has been damaged or destroyed. • Routes should be carefully selected to avoid mature trees and sensitive areas. • The impact on water bodies should be minimized by implementing an erosion and sediment control plan and by following best management practices. • Vegetation clearing and tree removal should be limited to only what is necessary to construct the project. Mature trees located within the construction area should be identified and protected during construction. Vegetative cover should be appropriately maintained during construction to minimize erosion of excavated soil and sediment loading to adjacent surface waters. • Construction of stream crossings should be limited to occur during low-flow periods. • “Cut-and-cover” construction crossing of streams and water bodies should be avoided wherever possible; tunneling or other “trenchless technology” construction methods should be used to minimize sediment disturbance. • Sedimentation basins should be used to reduce the discharge of water high in suspended solids. • Disturbed areas should be revegetated with native trees, shrubs, and herbaceous plants. This would compensate for impacts and minimize colonization by invasive species. A diverse mixture of vegetation in three canopy layers would stabilize soils, minimize erosion, and eventually shade aquatic habitats. Sediment control features should be retained until the plants cover the site. Weitkemper currently serves on the Mayor's Infrastructure Task Force. He has advised and criticized city officials over public works policies (rate discounts, master meters, misappropriations) that hurt the public while helping an elite group of bankers, developers, big businesses, and large institutions.